Blackbeard outwitted Bonnet. He knew full well that the major would attempt a pursuit as soon as he discovered this treachery. 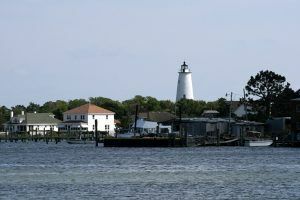 He dropped hints that he was sailing for Ocracoke Inlet, and then set a course for the town of Bath. Bonnet had hardly left this town before Blackbeard appeared offshore. Swaggering up to the house of Governor Charles Eden, he surrendered himself and 20 of his men, all of whom were granted the king’s pardon. The pirate seems to have been no stranger to the governor, for already there were stories that he had been paying the governor for protection. Governor Eden had arrived in the colony in 1714, and he was to remain as chief executive for the next eight years. Before long it was whispered around Bath that any pirate was safe in North Carolina waters so long as he shared his loot with the governor. As one contemporary writer said, “These Proceedings shew that Governors are but Men.” Tobias Knight, the governor’s secretary, member of the Council, and acting chief justice was also reported to have his finger in the pie. Others welcomed the pirate. 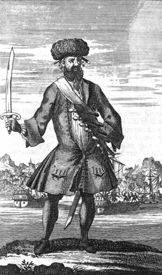 Blackbeard himself boasted that he could be invited into any home in North Carolina. Romance then entered the life of this arch-pirate. He bought himself a fine home and his lavish display of fine silks, jewels, and gold so dazzled the eyes of one 16-year‑old lass that she readily consented to become his wife. The governor himself attended the wedding, while some reports say that he actually performed the ceremony. Unknown to his bride, this was the pirate captain’s 14th wife. Gossip around Bath murmured that there were no less than 12 Mrs. Teaches still living in various ports in the West Indies. The newest Mrs. Teach, however, soon had occasion to regret her trip to the altar. Her new husband treated her little better than a member of his crew. In fact, he behaved towards her so shamefully and with such brutality that even the former members of his crew began to protest. For the next few months, Blackbeard’s life ashore was one of merrymaking and dissipation. He made friends with the neighboring planters by bestowing upon them gifts of rum and sugar. Entertainments in his home were on a lavish scale. Not even a pirate’s treasure would last very long under such a strain. As his fortune thinned, so did his disposition. The former jovial host now grew sullen. Neighbors who had a short time earlier been guests in his home were now robbed when the opportunity presented itself. Ships making their way up the river were sometimes plundered and robbed. Yet no one dared identify Teach as the culprit. The rewards of this small-time piracy were meager. Greater riches could be found out in the ocean. A call was sent out to old members of his crew to rejoin him. The eight‑gun sloop Adventure was prepared to go to sea. To those who asked, the respectable Mr. Teach answered that he was planning a trading expedition to the West Indies. The pirate bridegroom then slipped down the river to the open sea where the hunting was good. Within a few weeks he was dropping anchor again at Bath, with a large French ship as a prize, richly laden with sugar, cocoa, spices, and other merchandise. Blackbeard’s report bordered on the ridiculous. This French ship, he reported to the governor, he had found drifting at sea, with no sign of any human being on board. The truth was far different. He had actually captured two vessels flying the French flag, but the cargo of one was not worth plundering. Both crews had been placed on this prize and allowed to go their way. The ship with the richer cargo was brought back to Bath. A Vice-Admiralty Court was convened by Governor Eden. Tobias Knight sat as the judge. The French vessel was then condemned as a legitimate prize, and the pirates were given permission to sell the cargo. They could have sold the ship also, but this was risky; someone might recognize it and tell the true story. The pirate captain thereupon announced that the prize was too leaky to be seaworthy and, with the Governor’s permission, she was towed upriver from Bath and set afire. When the flames consumed everything above the water line, the portion of the hull still afloat was sunk to conceal all remaining evidence. It was rumored around the community that the Governor had received 60 hogsheads of sugar and Tobias Knight 20 as their share of the loot. Back to sea went the pirate, navigating up and down the coast, attacking any unwary ship that crossed his path. Frequently he turned into one of the many rivers along the coast, sometimes to hide and sometimes to provision his sloop. Supplies were secured from one of the many plantations lining the banks of the stream. If he wanted to appear as an honest seaman, a fair trade would be made for the provisions. Otherwise, the pirates took what they wanted, by force if necessary. The Adventure cruised as far north as Pennsylvania, and upon a number of occasions, Blackbeard and his crew boldly walked the streets of Philadelphia. This was too much for the people of that city, and Governor William Keith issued a warrant for the pirate’s arrest. By this time, however, Blackbeard had sailed southward again, to the healthier environment of North Carolina. Despite the friendship of the governor, even this colony was no longer the safe haven it had once been. Human endurance had been pushed to the limit by the insolence and insults of the pirates. Every captain who took his ship out of port was gambling on his ability to slip by the buccaneers. Something had to be done. When help came, it came from the neighboring Colony of Virginia rather than from North Carolina. Virginia, because of the valuable cargoes carried in and out of Chesapeake Bay, had long been plagued by pirates. In 1717 Governor Alexander Spotswood of that province reported that sea traffic was practically at a standstill because pirates were almost constantly patrolling the ocean off the Virginia Capes. During one six‑week period, not one ship dared to leave the safety of Virginia shores. Spotswood was no Eden. His activities in suppressing the buccaneers were just as vigorous as Eden’s were lax. And so it was to the governor of Virginia rather than to Eden that the people of North Carolina turned. The “Trading People” of the colony transmitted a number of pleas for help to their neighbor to the north. Witnesses were found who signed statements, or affidavits, indicating the close relations between Governor Eden of North Carolina and the pirates. Even with these accusations, there were certain legal obstacles which must first be cleared away. Because Teach had accepted the king’s pardon, he was supposedly no longer a pirate. Evidence had to be secured that proved he had committed additional acts of piracy after his acceptance of the pardon and taking the oath. This evidence was found in Virginia. A man named William Howard, who at one time had served as quartermaster under Teach, was captured in the colony. Charged with serving with “one Edward Teach and other wicked and desolate persons . . .” he was brought to trial not having the “Fear of God before his Eyes nor Regarding the Allegiance due to his Majesty nor the just Obedience he owed to the Laws of the Land. . . .” Howard broke down under questioning and it was from his testimony that it was learned that Blackbeard and his crew had returned to a career of piracy after accepting His Majesty’s pardon. Not only that, but they had taken at least two prizes since they had resumed the profession.